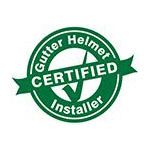 Gutter Helmet of Mid-State IL is a leading provider of home remodeling services in Illinois. We are proud to be an authorized dealer of the Gutter Helmet gutter protection system. We have many years of experience helping homeowners protect their homes from water damage with our expert services. One of the biggest sources of water damage to homes is a clogged rain gutter. When leaves and other debris stop water from flowing to the downspout and away from your home, the water can overflow and erode the soil around your foundation and eventually damage it. The Gutter Helmet system is the solution to that. By preventing materials from entering the system, rainwater will flow unimpeded. If you have cracks in your foundation, and/or excessive moisture or pooling water in your basement, then defective and clogged gutters are most likely the cause. However, fear not, Gutter Helmet of Mid- State IL has a solution for that also! Our services include B/Dry Systems, the permanent solution to wet basements. For homes that are having problems that are more serious with flooding basements, we have the B/Dry Trench system, which installs trenches and pumps under the basement floor to once and for all end flooding. Wouldn’t it be much easier just to install a Gutter Helmet gutter cover and prevent this from happening in the first place, as well as eliminate the tiresome chore of gutter cleaning? Many homeowners wish they did. Let someone from our team come to your home, inspect your gutters and foundation, and give you recommendations for improving your water protection. We also offer high-end kitchen and bathroom remodeling. For more information about our services, contact us today at (800) 824-3772 or fill out our online form for a free quote. We are looking forward to serving you!